Everyone will want to cuddle up with this adorable Wookiee this Halloween! This Star Wars baby Chewbacca costume consists of a furry brown hooded hat and a brown, fur-detailed romper—both of which are made out of a soft poly-flannel material. It velcros for closure in the back and provides easy access. 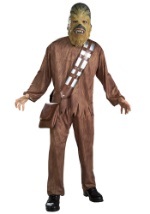 The detailed sash and matching pouch are attached in order to give this costume it's fully Chewbacca look. Have fun with the family this Halloween with a variety of our Star Wars costumes for a fun family look that is sure to please!